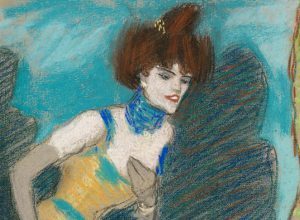 This month of June our collection once again enters into dialogue with works belonging to other collections. The works The studio at La Californie (1956), Dwarf and Adolescent (both from 1969) can be seen in the gallery 16 and in the galleries of the series of Las Meninas, respectively. 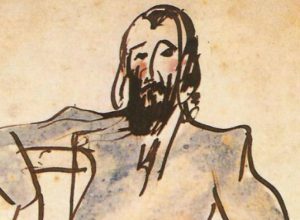 Throughout his life Picasso showed interest in many artists from the past, and he ended up producing interpretive works and series of many of them, such as Velázquez, El Greco, Goya, Cranach, Rembrandt, Poussin, Ingres, Le Nain, Grunewald, Delacroix, Courbet or Manet. 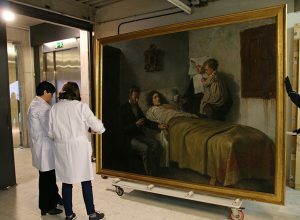 Picasso’s admiration for the work of Velázquez began when visiting the Museo del Prado for the first time in 1895. 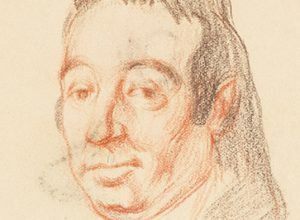 From among all the masterpieces of the Madrid gallery, the young artist chose the portraits of El bufón Calabacillas and Francisco Lezcano, el niño de Vallecas to produce copies in a sketch book conserved in the museum. Two years later, once again in the Museo del Prado, he copied in oil the Portrait of Philip IV and drew details of Las Meninas and Las Hilanderas by the painter from Seville. 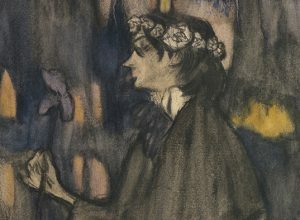 Sixty years later Picasso returned to Velázquez with renewed force. In 1957 he faced Las Meninas and produced a highly detailed study of the rhythm, color and movement, in a constant game of imagination and creative innovation, without losing, however, the fidelity to the atmosphere of the canvas of Velázquez. 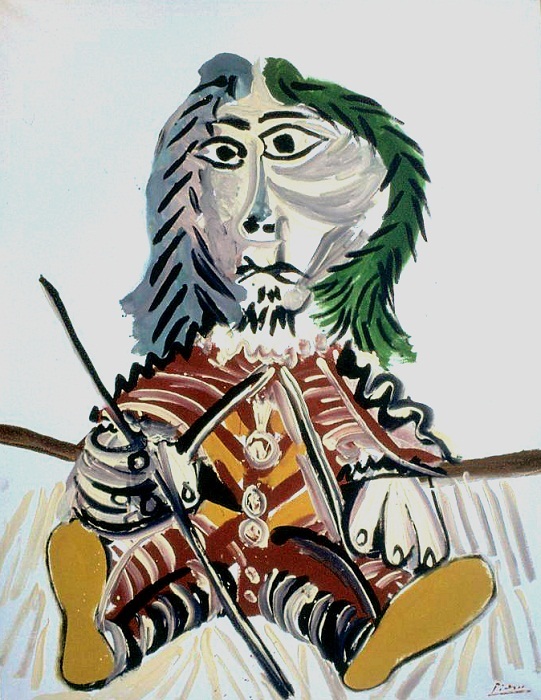 In 1966 the gentleman of the Spanish Golden Age emerged as a dominant character in Picasso’s paintings from period. These gentlemen evoked at the same time the protagonists of the picaresque novel and the figures of the Spanish baroque paintings, which, in 1970, Alberti referred to as the “family of serious Spanish gentlemen of El Greco, Velazquez, and Quevedo” and the Dutch, especially Rembrandt. The two guest works that we present along with the Las Meninas are a later homage by Picasso to the court jesters of Philip IV portrayed by Velázquez: Sebastián de Morra and Francisco Lezcano, el niño de Vallecas, summing up with them the admiration and dialogue that he established throughout his life with the work of Velazquez. Furthermore, the studios of La Californie – the mansion situated in Cannes where Picasso settled down in 1955 with his partner, Jacqueline Roque? represented the culmination of a constant topic throughout his life, the studio as a space for creative work and the everyday life of the artist. 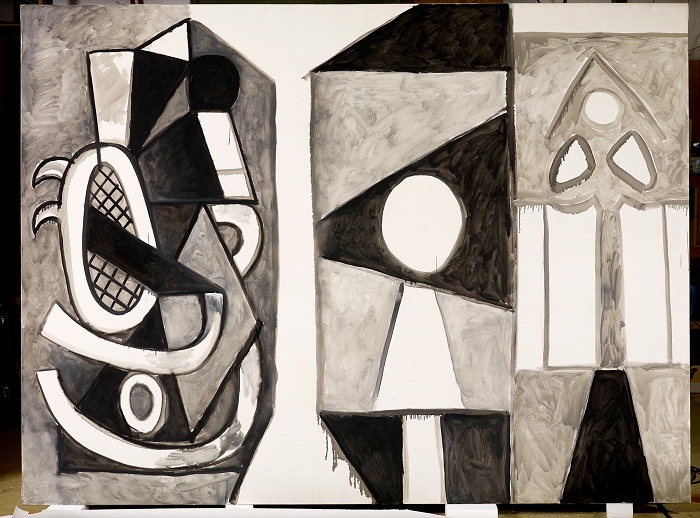 In 1955 and 1956 Picasso painted a large number of variations of the interior of the villa. The works that make up the first collection, produced in October 1955, reflect the luminous space resolved by means of cold colours; the studio is empty, without human presence. The large window with enormous curves is highlighted as a dominant element in this first phase. After the Winter break, in March 1956 Picasso takes up the theme of the studio again, but now the human presence can be noted, first timidlythrough the composition and layout of the space, and little by little the presence of a female figure makes itself felt, seated in a rocking chair. 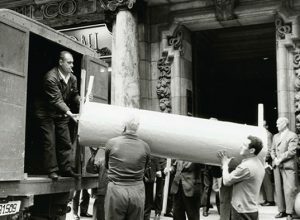 The work, The studio at La Californie, deposited for a long time in the museum, belongs to this last group and is located in gallery 16 of the museum. The female figure, probably Jacqueline, appears seated in a rocking chair, sharing the protagonism with the light that shines through a large window.